I play Dungeons and Dragons with a couple of groups. One group meets online. The other actually plays the way the game started, with pencils and paper and dice and maps. For the latter group, we get together roughly every 2-3 weeks. Part of that involves food. We've had theme food night and last week, it was breakfast. Originally, I was going to make a chocolate walnut bread, but chose to sink my time into sewing shirt number 2. But I still had to bring something. I wasn't interested in dashing to the store for anything. I wanted to bake. What could I make that was quick but symbolic of breakfast? I know. 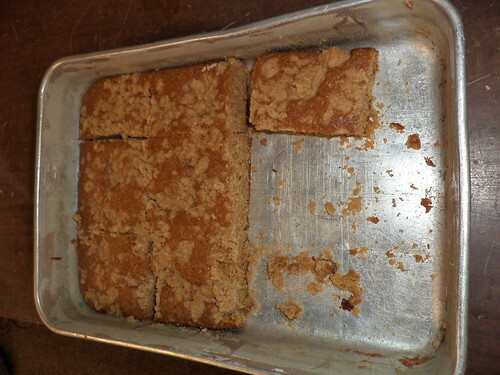 Mom's coffee cake. It's ridiculously simple and I've probably blogged about this before. Mix dry ingredients together with vegetable oil. Set aside a cup of this crumbly mixture and add egg and buttermilk to the rest. 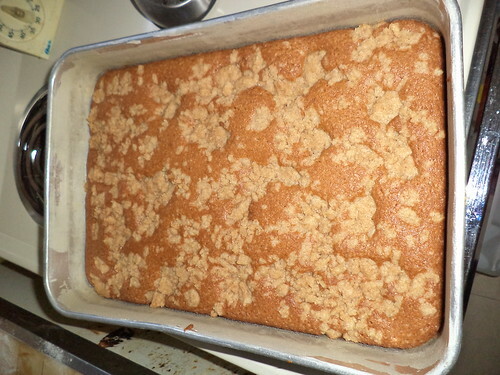 Pour into a 9x13 greased and floured pan and sprinkle the saved crumb over the top. 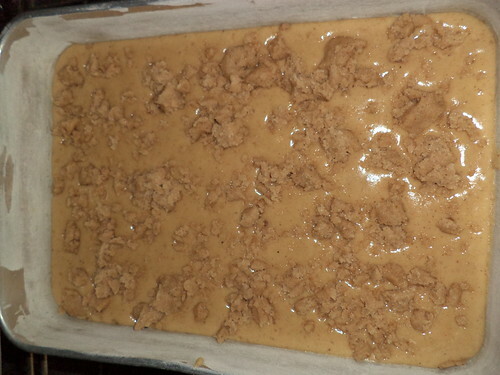 Bake at 350 degrees for 45 minutes and inhale the fragrance of cinnamon and nutmeg and brown sugar. Cut in pieces and serve warm, with ice cream or cooled for breakfast or as a snack. This cake freezes very well. I've made it, cut it into pieces and stuck the pieces in the freezer. Even defrosting them at 3-4 months out, they were still moist. This was a staple of family meals when I was growing up. I don't know if mom remembers where she found the recipe but she's been making this for at least 55 years, maybe longer. It's pretty much foolproof and would be a great cake to get kids cooking. I took what was left to the office and then finished off what was left after everyone at work had a piece. 2) Grease and flour a 9 x 13 inch pan. 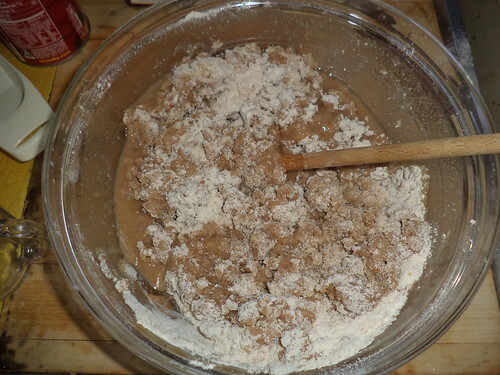 3) Mix flour, sugars and spices together. 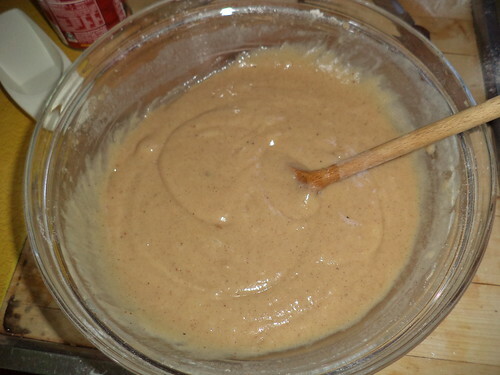 4) Add oil to dry ingredients, stirring until blended and mixture is lumpy. 5) Reserve 1 cup of the flour/sugar mixture. Set aside. 6) Add egg, buttermilk, soda and salt to the remaining mixture. Beat until well blended and creamy. 7) Sprinkle reserved mixture over the top of the batter. 8) Bake in preheated oven 45 minutes or until a tester comes out clean. 9) Remove from oven and let cool 10 minutes before cutting and serving. May be frozen for later servings.